Dir: Tim Wardle, US, 2017, 96 mins. 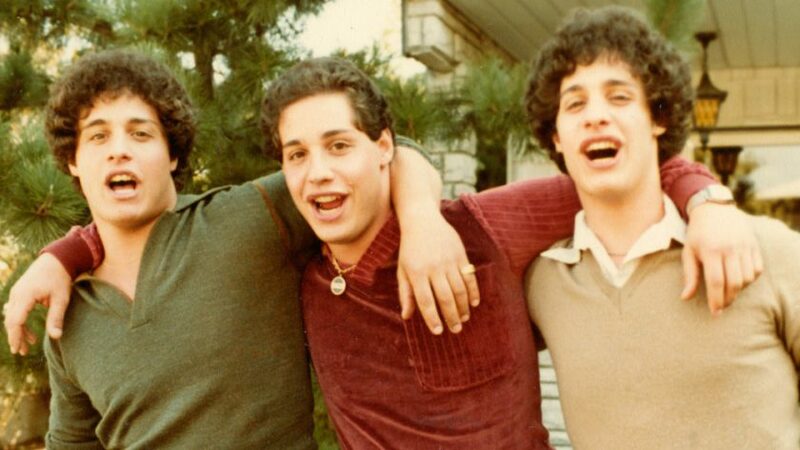 This is the amazing story of how three identical triplets, who had been separated at birth, met for the first time in 1980 after 19 years. It has been made into a fascinating documentary by Tim Wardle. It is difficult to write too much about the story without spoiling the revelations which come throughout the film. Not only did the boys, who had been given for adoption to three different families, not know of each other’s existence, but neither did the adoptive parents. David, Eddy and Bobby were born to an unmarried young woman and then deliberately separated and handed to three very different families. It later transpired that the families were of different social and economic status and the family structure was carefully controlled – each had an older sister, also adopted. The documentary re-creates how Bobby Shafran goes to a new college where he knows nobody. On his first day many greet him as a friend and call him Eddy. Eventually, the best friend of |Eddy Galland turns up. He sees the spitting image of his friend and finds that Bobby was born on the same day and had, like Eddy, been adopted. The two boys meet up and are ecstatic. Initially they get on really well and move in together. However, after they open a restaurant called – but of course –Triplets, things begin to fall apart. The adoptive parents are angry that they were not told anything about the boys being triplets who were separated at birth. The involvement of a psychoanalyst, Peter Neubauer, doing a research project on nature versus nurture, turns the story into a darker area. There is also tragedy and the whole documentary is part re-telling of a childhood of separation and then discovery and togetherness and part detective story as we follow the trajectory of their lives. Interviews with the boys’ wives are instructive – each wife insists that her husband is the most handsome – as are, of course, face to camera interviews with some of the adoptive parents. Better made and more astonishing than many a full-blown fictional film, this incredible but true documentary is definitely unmissable.